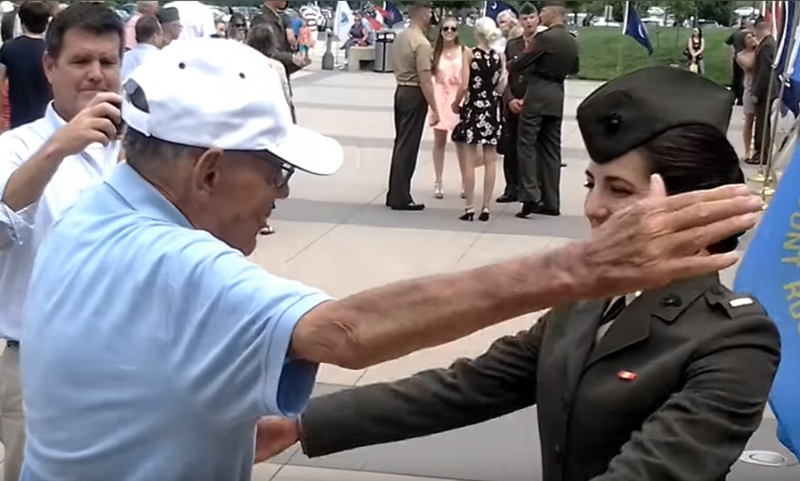 A video is making major rounds online showing a newly-commissioned Marine second lieutenant receiving her first salute from her grandfather, and it’s delivering a swift punch to the feelings of viewers everywhere. Every commissioning is accompanied by a memorable first salute, and for 2nd Lt. Charlotte Williams that special occasion was carried out by her grandfather, retired Marine Staff Sgt. James Williams. After delivering a salute that would make any drill instructor proud, the elder Williams went a little off script from the standard procedure. “Staff Sgt. Williams, requests permission, ma’am, to hug his granddaughter, 2nd Lt. Charlotte Williams,” he said. “Permission granted,” the younger Williams responds before embracing her grandfather, triggering waterworks so pure that they flow like the waters of Lake Minnetonka. Although the original video of the ceremony, which took place at the National Museum of the Marine Corps in Quantico, Virginia, was uploaded in 2013, a recent post on Reddit has given new viral life to the the touching moment for all to enjoy.